The Venerable Tsangsar Tulku Rinpoche holds the family lineage and monastery of Tulku Urgyen Rinpoche in Nangchen, Tibet, and is the nephew of Ven. Chokyi Nyima Rinpoche. He was recognized by H.E. Tai Situ Rinpoche as the fourth incarnation of a heart student of Situ Pema Nyinche Wangpo. 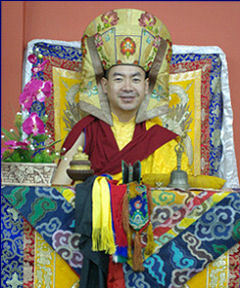 Rinpoche received ordination as a Bhikshu from the late very venerable Dabsang Rinpoche, completed a traditional 3 year meditation retreat by the age of 16, and studied all the major Buddhist philosophical texts under great masters at Sertha Larung Gar in Tibet, and Dzongsar Institute in India. At the request of Tulku Sherdor, on behalf of all those practicing Vajrasattva as a Vajrayana preliminary and/or yidam deity, Rinpoche will offer the empowerment of Vajrasattva from the "Threefold Secret Essence" (gsang thig 'khor gsum) treasure cycle of the treasure master Chokgyur Lingpa. There will be a recommended donation at the door of $50 for this precious empowerment. You may freely offer more or less, in keeping with what constitutes generosity and gratitude within your financial circumstances. Please examine your own motivation in this regard.